Easter is upon us. 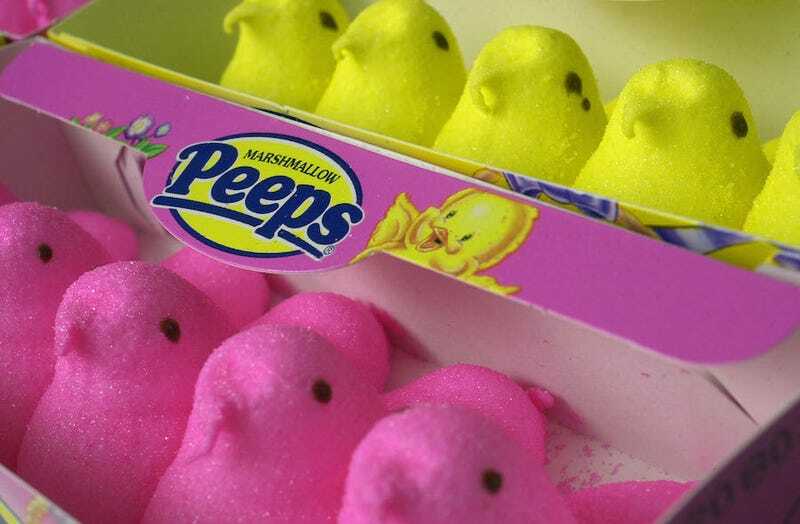 You know this—even if you don’t have a grandmother sending increasingly frantic texts asking what time you’ll be there for dinner on Sunday—because the commercials have all gone pastel and there are goddamn Peeps everywhere. If you don’t care about the religious significance, Easter does not have a lot going for it as far as nationally recognized holidays go. There is no obvious excuse to party, it doesn’t usually involve getting days off work, and Peeps are the absolute worst seasonal/holiday candy. Yes, it’s a close call between the sugary scourges of other holidays and the even sweeter cult favorite of Easter. There’s the omnipresence of pumpkin around Thanksgiving, the way mint sneaks into otherwise perfect chocolate come Christmas, and who even knows what Irish Potatoes are? But if you ask me, Peeps are the worst of all of them. Candy Canes are not awful, by any means. At least not in taste or texture—which are the primary criteria for judging anything edible, of course. But candy canes have a liability that drops them right down into the basement of seasonal treats: It’s almost impossible to eat a candy cane without inadvertently turning your festive fare into a small, minty fresh spear. Candy is not, actually, a necessity and so in order to be worth eating, the upside has to outweigh any risks. And when the risk entails impaling the roof of your mouth—or at least pricking your tongue—I’m just not sure candy canes can clear that bar. And if you’re not brushing your teeth or chewing on some gum, do you really want something that starts tasting like stale mouth-freshener after the first coat of peppermint is licked off? Candy Corn tastes like corn syrup-flavored Tums. It’s been tormenting taste buds since it debuted in 1880, when it was more accurately called “chicken feed.” It contains no eggs, dairy, or gluten—all things which should be in your desserts. It does contain beeswax—something that should not be in your dessert. A serving size of candy corn is 20 pieces, which makes it probably the only food (and certainly the only sweet) that has never been consumed in quantities larger than the recommended serving size. This is not a point in candy corn’s favor. However, you are practically guaranteed to eat at least some candy corn every year. It is a not-exactly-pleasant-but-not-exactly-unpleasant side effect of Autumn. It is the nationally-shared Halloween experience. Peeps are basically bad marshmallows that can’t be turned into s’mores. And since all marshmallows that aren’t either melted into s’mores or dehydrated into Lucky Charms are a waste of space, peeps are worse than a waste of space. And even if the flavor doesn’t turn you off totally, it’s worth noting that an Emory University study found them to be completely indestructible even when subjected to a microwave, tap water, boiling water, acetone, and sulfuric acid. Exposed to Phenol, everything disappeared but the eyes, which is just spooky. But perhaps the worst part about peeps is just how much some people love them. Two billion peeps were produced in 2015—this is not a candy that’s going extinct anytime soon. And all this peep love is keeping chocolate bunnies from assuming their rightful place as the sole sweet Easter mascot. Oh, and, no: poop emoji peeps do not improve the situation. So, which of these oft-maligned seasonal candies is the worst? Do you secretly or not-so-secretly love one or all of them? Is there some other terrible seasonal candy that deserves more ridicule?